Submitted photo The boys cross country runners prepare to run in the Mid-Ohio Athletic Conference meet in Marion on Saturday morning. Galion finished fourth overall in the field while Shelby ran away with the title. Braxton Tate would run his way to a new school record and a third place finish with a time of 15:50.5. MARION — On Saturday, the cross country teams representing Galion High School headed to Marion to compete in the Mid-Ohio Athletic Conference meet. Both Galion squads would earn fourth place finishes in the conference meet on the day as Shelby ran away with the boys crown while Ontario captured the girls title. Junior Braxton Tate was the highest placing Tigers’ runner on the day, earning third overall in the boys race and was the only runner to finish in the top seven that wasn’t representing the state-ranked Whippets. In the process of claiming third in the field, Tate also became the new school record holder in the sport with his finishing time of 15:50.5. Team scoring in the boys race on Saturday went as follows: 1. Shelby- 18; 2. Buckeye Valley- 91; 3. Ontario- 97; 4. GALION- 101; 5. Pleasant- 146; 6. Harding- 149; 7. River Valley- 155 and 8. Clear Fork- 199. In total, there were 69 runners competing in the boys portion of the event in Marion. Caleb Brown earned the individual title for Shelby, outlasting his teammates and Tate with a time of 15:32.7. Brenden Ganshorn finished in 14th for Galion with a time of 18:00.9 and was the only other Tigers’ runner to crack the top-25 for the boys. Garrett Murphy claimed 26th in 18:37.7 and Braeden Horn was 34th with a time of 19:15.4. Other Tigers in action Saturday were: 36. Kurt Ensman- 19:16.6; 38. Zach Slone- 19:30.4; 44. Mikey Stover- 19:53.4; 47. Hunter Parsley- 20:09.1; 49. Simon Shawk- 20:12.3 and 61. Sean Clark- 21:56.3. Team results on the girls side were: 1. Ontario- 24; 2. Buckeye Valley- 43; 3. Shelby- 65; 4. GALION- 95; 5. Harding- 152 and 6. Clear Fork- 158. Makenna Heimlich of Shelby outlasted the other 55 runners in the field to earn the girls crown, finishing her race in a time of 18:58.0. Freshman Zaynah Tate was the top finisher for the Lady Tigers in the conference meet, running her way to 19th overall in a time of 21:12.3. Joining Tate in the top-25 on the day were Sari Conner, Brooklyn Gates and Emily McDonald. Conner ran her final MOAC meet in a time of 21:42.2, good for 22nd while Gates ran her 5k in 21:50.5 to claim 23rd. McDonald kept with the pack and ran to a 24th place finish in 21:56.7. Other Galion runners on the girls side and their placements were: 27. Ava Smith- 22:18.0; 28. Airyona Nickels- 22:20.8 and 53. Harmony Lohr- 27:19.0. Up next for the Tigers’ runners will be the Division II district meet, which will be held on Saturday, October 20 at Amanns Reservoir Park in Galion. 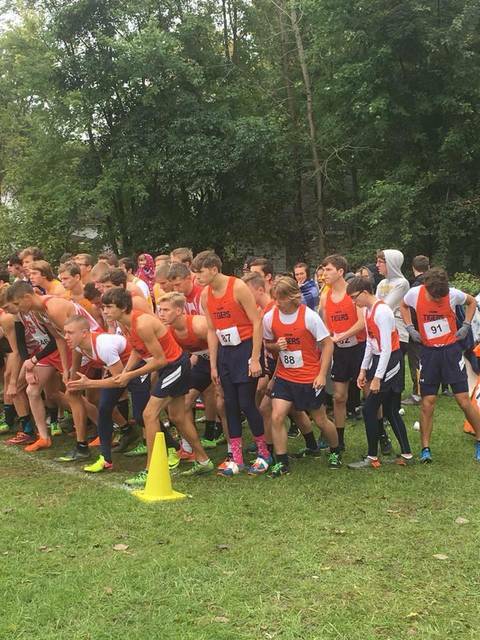 Action is set to begin for Division II races at 10 a.m.
https://www.galioninquirer.com/wp-content/uploads/sites/38/2018/10/web1_boys-and-new-unis.jpgSubmitted photo The boys cross country runners prepare to run in the Mid-Ohio Athletic Conference meet in Marion on Saturday morning. Galion finished fourth overall in the field while Shelby ran away with the title. Braxton Tate would run his way to a new school record and a third place finish with a time of 15:50.5.